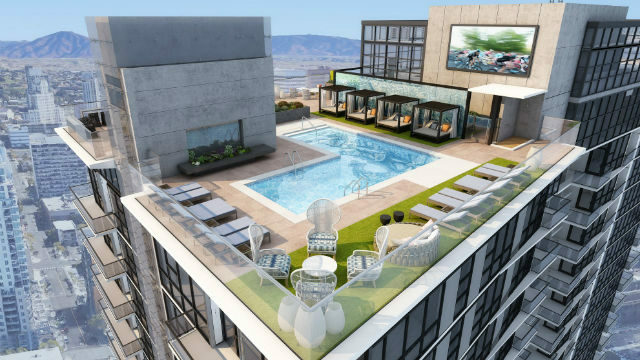 Luma, a 220-unit, luxury high-rise apartment building, has opened for leasing in downtown San Diego’s Little Italy neighborhood. Developed by LMC, a subsidiary of home builder Lennar, the 24-story tower at 1440 Columbia Street offers offers studio, 1-, 2- and 3-bedroom apartments, a small number of penthouses, and 4,300 square feet of ground-floor retail space. Apartments feature high ceilings, large kitchens with quartz countertops and center islands, wood-style flooring, keyless front doors, full-size front-loading washers and dryers, walk-in closets and walk-in showers. Community amenities include a rooftop pool and spa with casual seating, barbecue grills and an outdoor theater. There is a 24-hour fitness center, a pet park, bicycle storage and EV-charging stations. ”The Little Italy neighborhood is one of the most distinctive in the nation, whether it’s the breathtaking views of the waterfront or the always bustling sidewalks and patios,” said Ryan Gatchalian, division president of Southern California for LMC. “We’re thrilled to join one of San Diego’s most desirable neighborhoods, and we believe Luma will complement the area’s vibrant energy and provide a top-tier downtown living experience,” he added. LMC has 26,300 units under development nationwide, including high-rise, mid-rise and garden apartments.